TMNT: THE TEENAGE MUTANT NINJA TURTLES ARE BACK! The Teenage Mutant Ninja Turtles were created in 1984 by Peter Laird and Kevin Eastman. It was created to spoof the world of superhero characters. The original comic book was published in black-and-white and only 3,000 copies were printed, which, much to everyone's surprise, sold out right away. The concept originated from a comical drawing sketched out by Kevin Eastman during a casual evening of brainstorming with his friend Peter Laird. The drawing of a short, squat turtle wearing a mask with nunchakus strapped to its arms was incredibly funny to the young artists, as it played upon the inherent contradiction of a slow, cold-blooded reptile with the speed and agility of the Japanese martial arts. At Laird's suggestion, they created a team of four such turtles, each specializing in a different weapon. Eastman and Laird often cite the groundbreaking work of Frank Miller and Jack Kirby as their major artistic influences. Using money from a tax refund together with a loan from Eastman's uncle, they formed Mirage Studios and self-published a single-issue comic book that would parody two of the most popular comics of the early 1980s: Marvel Comics' The New Mutants, which featured teenage mutants, and Daredevil, which featured ninja clans dueling for control of the New York City underworld. In fact, many comics fans will recognize in the Turtles' origin several direct allusions to Daredevil: The traffic accident, involving a blind man and a truck carrying radioactive waste, is a reference to Daredevil's own origin story. The name "Splinter" is a parody on Daredevil's mentor, a man known as "Stick." The Foot, a clan of evil ninja who became the Turtles' arch-enemies, is a parody of the Hand, who were themselves a mysterious and deadly ninja clan in the pages of Daredevil. And what has begun as a spoof turned out to be a phenomenon resulting in two sets of popular TV series (the first set which began in the 1980’s and the other one which began in 2003), a very popular toyline and merchandising, three live-action movies, and this new CGI-animated feature film. 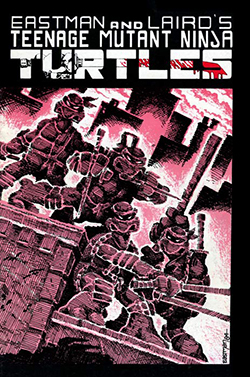 In keeping with their parody of "grim 'n gritty" comics of the early 1980s, the Turtles engaged in a greater amount of overt violence in the pages of the early Mirage comic book series. As the TMNT were introduced into the mainstream, they were radically redesigned for a younger audience. This evolution incensed a core group of fans who had faithfully collected the independently-published comic series from its inception. They accused Eastman and Laird of selling out their indie roots in favor of corporate greed. In issue #19 of Eastman and Laird's Teenage Mutant Ninja Turtles, the creators published an editorial addressing these concerns. It stated, in part: "We've allowed the wacky side to happen, and enjoy it very much. All the while, though, we've kept the originals very much ours – forty pages of what we enjoy and want to see in our books, whether it comes from our own hands or from those of the talented people we work with." As the origin story goes (as based on the original comicbook), four pet turtles are exposed to a liquid mutagen during a traffic accident at which their young owner is a bystander. The mutagen causes animals to become more human-like in intelligence and dexterity. Also exposed to the mutagen is Splinter, a rat once owned by a ninjutsu expert named Hamato Yoshi. As a fantastically talented pet, Splinter taught himself the art of ninjutsu by mimicking Yoshi during his practice sessions. Yoshi emigrated from Japan to the United States in an effort to escape a bitter love triangle that resulted in the death of Oroku Nagi, a fellow member of his ninja clan. However, Yoshi was pursued and murdered by Nagi's younger brother, Oroku Saki, who grew to lead the American branch of the Foot Clan as the villainous Shredder. Yoshi's death leaves Splinter homeless, wandering the streets and sewers of New York City alone. Splinter happens upon the Turtles, still fresh from their accident and wallowing in mutagen, and adopts them. Within days Splinter and the Turtles grow to humanoid size and develop the power of speech. It is then that Splinter decides to train the young Turtles in ninjutsu, so they can grow strong enough to exact revenge on the Shredder for the murder of Splinter's beloved Master Yoshi. Splinter chooses names for the Turtles from the pages of an old discarded book on Renaissance art: Leonardo, Donatello, Raphael, and Michelangelo. The Turtles challenge and defeat the Shredder and his Foot clan in a rooftop duel, as Shredder is knocked off the building and plunges to a fiery death in the blast of his own bomb. In the new TMNT movie, the story follows that the Turtles have grown apart as a family. Donatello works as an information technology consultant. Michelangelo, in order to bring money in, has taken a job as a masked children's birthday party character (known as "Cowabunga Carl"). No one is sure what Raphael is up to, but it is revealed that he has been scouring the streets at night as a masked vigilante, the Nightwatcher, and Leonardo has become a pseudo-vigilante, pseudo-hermit who protects a village from oppressors. Struggling to keep the family together, Splinter then realizes that strange things are starting to happen in New York, ones that include his sons. Leonardo eventually returns from Central America but the reunion has not been easy for Raphael and has created a strain in the sibling rivalry between the two. But they must keep themselves united as they found out about the strange occurrences in the city that include mysterious monsters, invincible warriors, and the return of the Foot Clan. With the help of Casey Jones and April O’Neil, they investigate and face the evils that threaten the city. I have been so bored with the all-too-childish CGI animated movies made by Pixar and Walt Disney. The pseudo-environmental comedies and morals of animal cruelty have become over-supplied and stale. It was time for a CGI film that has some preach-free, fun-filled action on it. It was time for the Ninja Turtles to have a movie that would break the boredom of other CGI-animated movies. Sure, they may not have the flawlessly impressive graphics of Pixar and Disney, but Imagi Animation Studios delivers the graphics of the movie perfectly. One may feel awkward adjusting with the first scenes that seemed like an intro of a video game. But once it gets into your system, you get mesmerized as the graphics progress with more impressive scenes. Never underestimate the fight scenes of this movie. it may be a CGI animated film that is crowded by, generally, children's fanbase, but the action scenes concerning the martial arts are impressive and really are based on serious martial arts moves. The movie features voices of Laurence Fishburne as the narrator, Chris Evans as Casey Jones, Zhang Ziyi as Karai, Kevin Smith as the Diner, Patrick Stewart as Max Winters, and Sarah Michelle Gellar as April O’Neil. More importantly, the movie is marked as the last performance of the legendary Mako Iwamatsu as the voice of Splinter. The film is directed by Kevin Munroe who has done extensive animation work during the last decade including video games, television series, and original comic books. He has worked in developing both the writing and design of animated projects for companies such as Disney, Warner Bros., Cartoon Network, Fox Kids, The Jim Henson Company, Kids WB, Dark Horse Entertainment, IDW Publishing and Nickelodeon. To the keen fanbase, they may notice that the movie recites dialogues that tap references from the first Ninja Turtles movie (the one from 1987) such as "Two minutes for high sticking!" said by Casey Jones, the same line also found in the first (1987) TMNT movie spoken by the same character, and the relationship between Raphael and Casey Jones is strongly consistent with the events in the first movie, which was the only movie (of the three live-action movies) that had the same gritty feel of the comicbook. Based on how bad the third and second movie (the one with Vanilla Ice) were, it seems pretty fair to say that this movie can easily ignore those two sequels and serves as in direct continuity with only the first movie. TMNT has a great balance of dark aspects and kid-friendliness. Adults will love the grittiness and the action of the movie, but will also find well-placed "moral lessons" of sibling camaraderie and family values, in a non-cheesy manner. TMNT is thumbs-up family fun!